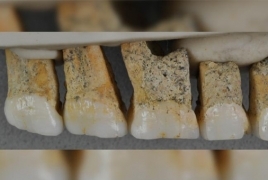 Ancient bones and teeth found in Callao Cave in the Philippines have led to the discovery of a previously unknown species related to humans called Homo luzonensis, according to a new study. The fossils belonged to two adults and one child who lived between 50,000 and 67,000 years ago, CNN reports. But what makes luzonensis different from other species? It's all in the distinct premolar teeth, which vary considerably from anything identified in the other species belonging to the Homo genus. This factor, along with the fact that the researchers haven't been able to remove DNA from the fossils, makes it difficult to determine where luzonensis fits, evolution-wise. Although separated by millions of years of evolution, luzonensis' toe bone strongly resembles that of Australopithecus afarensis, or the famed "Lucy" fossil. Australopithecus lived between 2.9 million and 3.9 million years ago.